Great living spaces begin with an idea. Your idea. At Ideal Cabinetry, our attention is focused exclusively on your concept, your timeline, and your budget. We pride ourselves in creating a lasting investment that is durable and unique. From space planning to cabinetry design and details, we can educate you and guide your selections every step of the way. 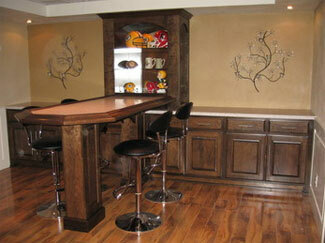 Our team at Ideal Cabinetry includes experienced design professionals. We take the time to understand your special needs and ideas. We're committed to the ideal that good design must address your personal needs and tastes. We have a complete showroom full of ideas, samples, finishes, hardware and options. The showroom also serves as a meeting spot to sit down and go over your plans or ideas and to view the final designs on the flat screen T.V. Transposing your ideas to paper is our specialty. Our talented and experienced design team captures every detail of your project. 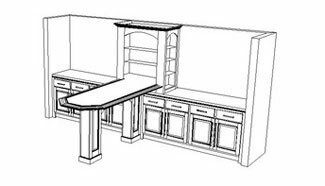 They create all of the drawings including; construction details, interior cabinet dimensions, and architectural detail with amazing representations of the final product, allowing you to see how it will fit in its intended space. Installation is where all of the design, drafting and production efforts come together. Our uncompromising attention to detail ensures your satisfaction. Our installation team shares this philosophy. Your complete satisfaction with your new kitchen, bath, or specialty room for years to come is our only goal.